Standing in front of several rails of clothes (no touch-catch floor to ceiling built-in wardrobes here), my friend Fiona blatantly laughed out loud when I said ‘I’ve got nothing to wear’. But honestly I don’t. I’m not sure it’s possible to do cold well without looking posh or Bristol NHU – and as neither look is working for me I’m not sure what the answer is. So for now I’ll just keep on ordering twinsets of thermals and hope for a change in the weather…. Categories: castle, country house, moving, scotland | Tags: clothes, thermals | Permalink. Today was fresh and dry so Ed put our willing new friend Claude to work pruning fruit bushes in the walled garden. Fiona and I admired the view. It looks like we have blackcurrants, gooseberries and raspberries – and as yet several other unidentifiable berries. We planted our first tree – a young apple next to the old. We have half a dozen old trees that obviously haven’t been pruned for years and we’re not sure what to do about them, although they look beautiful just as they are. Twisted and ancient and covered in lichen. What we are actually going to do with the walled garden itself is a much bigger question. It is of course wonderfully romantic; a little winding path leads up to a faded painted wooden door that opens onto a secret garden enclosed by huge stone walls and rusted iron railings. The railings make up one wall and are overgrown with bushes. Today Ed found a pretty iron gate hidden behind them; presumably the once grander entrance for the family of the house with the gardener’s wooden door set in the wall to the side. But… the walls are crumbling in places and the faded, rusted bits will all need attending to if we are going to maintain this beautiful place properly. There’s the grass to keep under control and the fruit trees to look after – and then we need to decide what to do with the rest of it … vegetable patches? an orchard? greenhouses? flower beds? The previous owners even suggested a swimming pool which has got to be crazy up here right? Then whatever we decide, we need to work out how we’re going to find the time to do it. It’s easy to be seduced by the magic of this place but once in a while we realise the enormity of what we’ve taken on. It can be overwhelming at times but I’ve quickly worked out it’s best not to think about it too much – you just have to deal with whatever is in front of you. I suppose it’s a kind of love affair – and as long as we have the energy and passion for this wonderful place we’ll find a way to make it all work. Categories: acres, castle, country house, countryside, gardens, moving, scotland | Tags: fruit bushes, orchard, walled garden | Permalink. Our first guests arrive. On my way to the train station the sun starts to shine and despite telling everyone to come laden with thermals and lots of layers the season seems to shift in one weekend. We have blue skies every day, the rooms are full of light and the house feels alive… and warm. I don’t know if it’s the change in the weather or a house full of people, children and a dog – but it does all feel very different. Various rounds of cooking, grand tours and dog walking ensue. Being able to have people to stay like this (we had just the couch for guests in London) is one of the reasons we bought this house and for the first time since we arrived I can really see us making a life here. 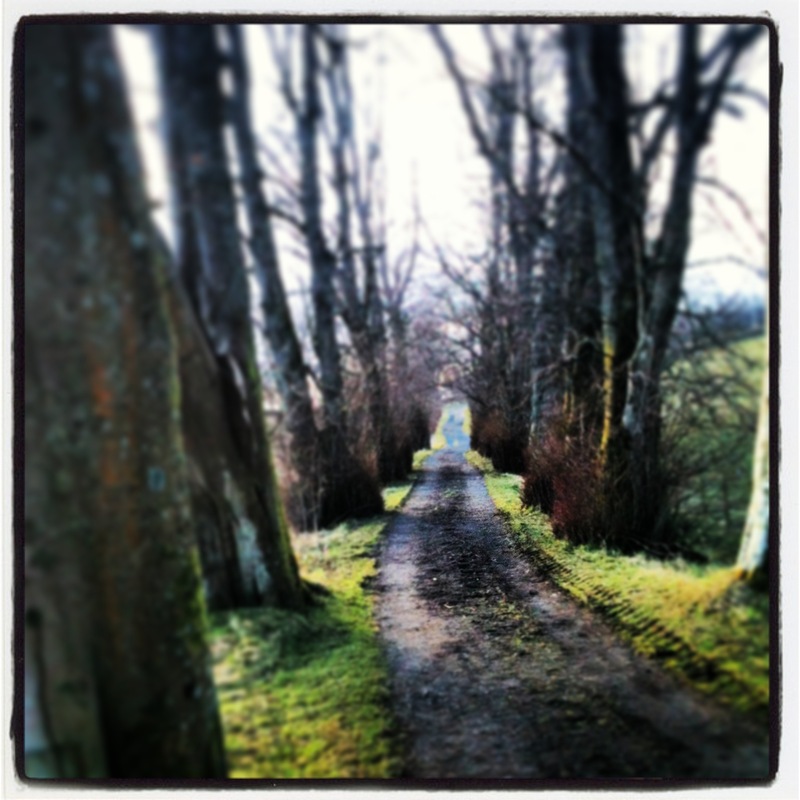 Categories: castle, country house, moving, scotland | Tags: easter, guests | Permalink. Ed’s just taken Gracie up to meet our new neighbour Mr C, the farmer, whose farmhouse sits on the hill behind us and whose fields surround us. They were invited in for a cup of tea and a chin wag. Ed tells me that Mr C’s quite busy up there – with motocross in one of his fields on a Wednesday, clay pigeon shooting on a Thursday and a rave in their barn every Friday night. I fell for this of course – but luckily Ed’s a bit less gullible. Sounds cheeky. I’m looking forward to meeting him. Categories: castle, country house, moving, scotland | Tags: farmer | Permalink. It’s snowing. I’ve never been this cold inside a house since I was a kid and we had no central heating. Before we moved up here I wondered whether it would be so cold in the winter that we’d be able to see our breath when we woke up in the morning – another childhood memory (also one of Ed’s) and not one that I intended to repeat. Ed thought not, given that the side of the house we are living in is partially double glazed – but I’m sad to say that this morning he was proved wrong. I’m going with the ‘just wear another jumper’ theory but I’m wearing thermals, several layers, a hat and 2 pairs of mountain climbing socks – and I still can’t get warm. So yesterday we dared to put on the heating. It’s oil powered and it costs a fortune. The previous owners advised only 6 hours for 6 months of the year (which cost them 6 grand a year!). Perhaps not surprisingly, 3 hours in the morning and 3 in the evening is making very little difference – and also feels totally extravagant as for now we’re only using a few rooms. There’s a window seat in the main room with a huge old cast iron radiator underneath, so when the heating’s on it’s an obvious place to take refuge. 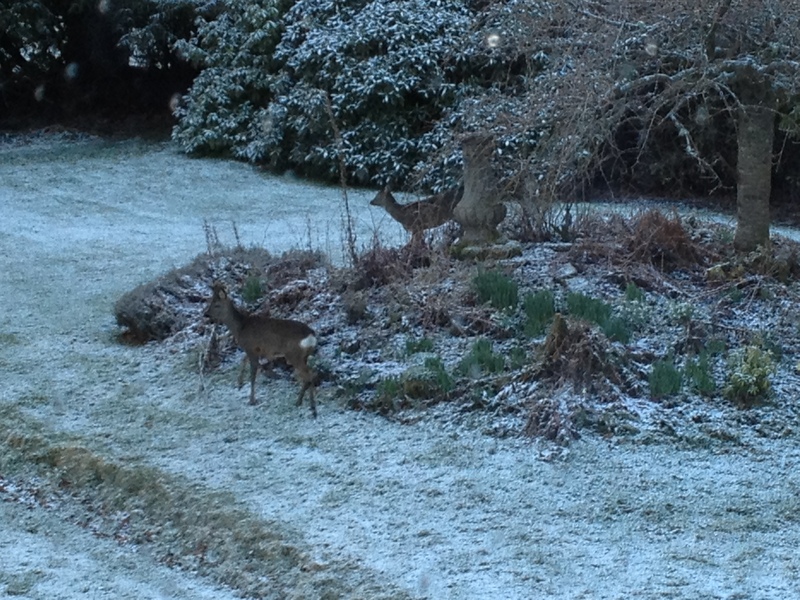 They stay for quite a while – skipping about in the snow and locking their baby antlers. It’s a magical scene. I’ve no idea how we’re going to live here comfortably in the winter – but a sprinkling of fairy dust like this does make me feel optimistic that we’ll manage to work it out. Categories: castle, country house, gardens, moving, scotland | Tags: deer, snow, winter | Permalink. It’s my birthday and we’ve just been for a walk around the gardens and found this… hidden in a yew tree behind the lawn. The perfect birthday surprise. 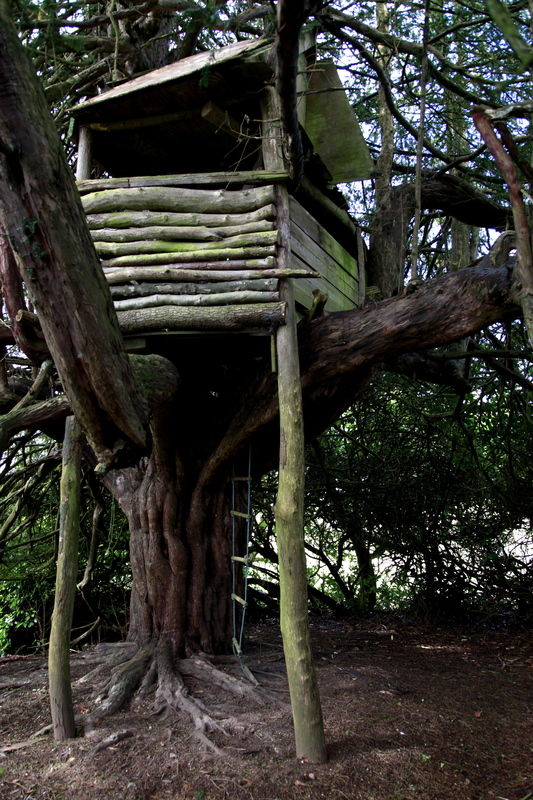 Categories: castle, gardens, moving, scotland | Tags: tree house | Permalink. It’s raining when we arrive (of course), miserably grey with a freezing cold wind that feels like a slap round the face as soon as we step out of the car. It’s only marginally warmer inside (we keep our coats, hats and scarves on all day) – a fact I try to ignore by focussing on where all the boxes should go and sorting out our beds. The removal men are very taken with the place and keep stopping to take photographs. There’s no doubt that moving here is the stuff of fairy-tales but today all my romantic feelings are trumped by the reality of just how bitterly cold it is. So we go to bed early, freezing cold and smelling of woodsmoke. Not quite the first night I’d imagined. Categories: acres, castle, country house, countryside, gardens, moving, renovation, scotland | Tags: cold weather, freezing, wood burner | Permalink.